Advances in ultrasound technology are reshaping the field of health care for obstetricians and pediatric specialists. Detailed fetal imaging has enabled medical professionals to detect fetal structural anomalies and research practical guidelines for prenatal diagnosis and postnatal management. 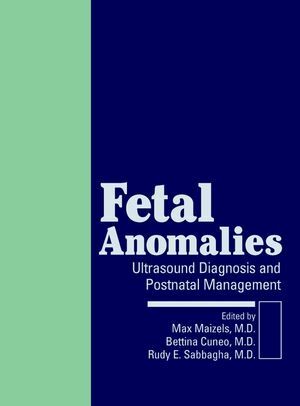 Fetal Anomalies: Ultrasound Diagnosis and Postnatal Management is a practical sourcebook with images of structural fetal malformations on a continuum that begins at the stage of ultrasonographic identification, progressing to characterization in the newborn period, and culminating in repair and postoperative follow up. Incorporating the pictorial strengths of an atlas with the didactic utility of a reference work, Fetal Anomalies: Ultrasound Diagnosis and Postnatal Management is a unique book bridging various specialties that comprise maternal-fetal medicine, such as obstetrics, diagnostic imaging, neonatology, perinatology, surgery, and urology. Accountants and Business Professionals, Students and Instructors of Accounting. The First Trimester Pregnancy (R. Sabbagha). The 10-14 Weeks Scan (R. Sabbagha). Detecting of Trisomies 21 and 18 (R. Sabbagha). The Fetal Face and Neck (R. Sabbagha). The Fetal Central Nervous System (R. Sabbagha). The Fetal Chest and Abdomen (R. Sabbagha). The Fetal Urinary Tract (M. Maizels). Diagnosis of Fetal Structural Genital Anomalies (D. Smith). Polycystic Kidney Disease and Renal Transplantation (R. Cohn & C. Firlit). The Fetal Heart (B. Cuneo and M. Ibawi). Skeletal Dysplasias and Musculo-Skeletal Abnormalities-- (R. Sabbagha).